We've been hearing an awful lot about Apple making their own TV set lately, and now rumors are being mongered that we may actually get a glance at the operating system that will be powering it next week at WWDC 2012. Details are scarce, but apparently the iTV OS will include a control out API for accessory manufacturers and other third parties, which could quickly turn an Apple-made television into the connected hub for your home. We've heard all sorts of crazy rumors about Apple's plans for TV, including that it will boast Siri voice recognition and Kinect-style motion controls. It seems likely that Apple will eventually produce something beyond the current Apple TV, regardless of feature set, considering Steve Jobs had claimed once upon a time that he had "cracked" the formula for the ideal TV. Odds are we won't see one on store shelves this year, so don't get too excited. Tim Cook was tight-lipped about their plans for TV at the D10 conference last night, but did mention that they've already sold 3 million Apple TVs this year, which was the sum total for all of 2011. That pales in comparison to iPhone and iPad sales, but still shows that Apple has a foothold in the TV world, and that they're gaining momentum. Transitioning to full TV sets could further estrange their relationship with Samsung, with whom Apple competes in the world of smartphones, but also relies upon for many iPhone, iPad, and Apple TV parts. Would Samsung also be willing to supply them for TV, too? 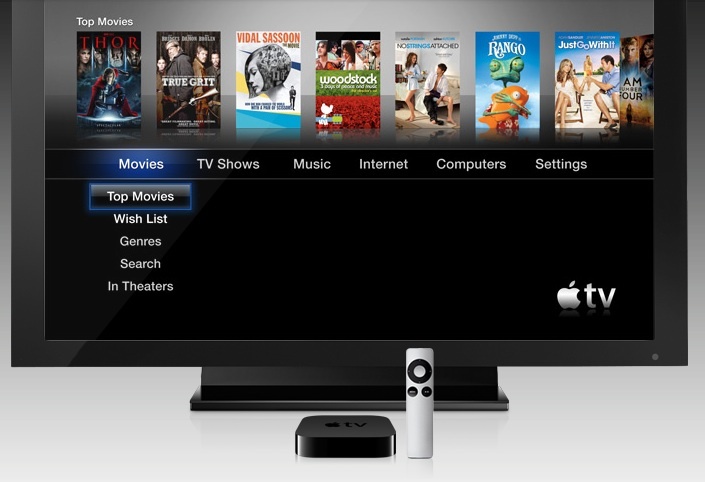 Apple TV owners, what kind of OS changes would you like to see in the next iteration? How likely do you guys think it is that Apple will, in fact, make the jump from set-top boxes to full-blown television sets? Will they be able to compete with the big boys like Samsung?